In June 2009, my friend Rebecca Bardach who was working for the Center for International Migration and Integration (CIMI) at that time, facilitated a group of Filipino diaspora donors at my mother’s living room to think about the potential of pooling funds together for philanthropic efforts to help in the Philippines. Last July 2011, I visited Clark and Subic, Philippines where I interviewed 21 victims of unexploded ordnance (UXO) including Norberto Dacuyan. I was shocked to see the unexploded mortars, shells and bombs that residents have dug up and found in their farms. This project was in partnership with the Alliance for Bases Clean Up about the US significant environmental damage left behind its former military bases in Clark Air Base and the Subic Bay Naval Facility in the Philippines. However, the US continues to deny its responsibility to clean up the toxic wastes left behind. They deny responsibility based on the military bases agreement that it does not have any well-defined environmental responsibility to clean up after the bases withdrawal (US General Accounting Office Report January 1992: page 6; Mercado, 2001: page 9). If the US unilaterally decides to clean up these bases in accordance to US standards, the cost for environmental clean up and restoration could reach Superfund proportions (US General Accounting Office Report January 1992). In 2016, the Philippine case is still far from being resolved after 25 years of the closure of the bases. The US continues to deny responsibility because the US-Philippines military bases agreement that it signed in 1947 lacked any provisions on environmental protection. The continued denial runs counter to the US’ core values of fairness and justice. In January 2011, I visited the former US military bases in the Philippines: Subic Naval Base and Clark Air Base and met with Mark Gilbore. I’ve learned for the first time the plight of Filipino Amerasians. In 1992, the United States military left the Philippines. The American GIs left behind 50,000 Amerasian children whose fathers were American sailors and their mothers were assumed to be prostitutes. In 1982, the US Congress voted to grant U.S. citizenship to Amerasians from Vietnam, Korea, Thailand, and other Asian countries, in what was known as the Amerasian Homecoming Act, except for Amerasians from the Philippines. The Filipino Amerasians are America’s forgotten children. On July 4, 2011, I joined about 50 young Filipino Amerasians with local partner Wedpro and we marched through the bars and red light district asking for recognition and to stop the racial discrimination and prejudice against them. The children of African-American soldiers are especially singled out and ridiculed. Mark confided in me that he suffered a lot of discrimination growing up. They grew up with the social stigma of being an illegitimate child and unable to elude prejudice because it shows in his physical features. Many Amerasian children are labeled Iniwan ng Barko (left by the ship). In 2016, Mark Gilbore is now raising a family and continues to live in poverty. Filipino Amerasians continue their tragic stories of discrimination and prejudice. They are America’s forgotten children. Since 2010, the Bayanihan Foundation has provided thousands of food packages to indigent Filipino Muslims in Iligan. The Zakat Foundation has sponsored this project for many years, with the tireless efforts of many people including my uncle and aunt, Dr. Vicente and Mrs. Luz Saavedra, the local Imam, Atty. Saidali Gandamra and countless volunteers from the Rotary Iligan South and Rotary Iligan East. The food packages are often distributed during Eid al-Fitr, a holy day that comes at the end of Ramadan. In July 2015, the NEXTGEN Fellows and the participants of the Kaluluwa Kolectivo were able to join me in distributing the food packages to indigent Filipino Muslims in the area. These Filipino-American students and young professionals traveling and rediscovering their heritage helped us that day. For the last five years, Christian Rotarian volunteers have packed, distributed and provided help in giving these food packages to indigent Filipino Muslims. The years of gift giving has engendered goodwill and trust among the local community and slowly but surely built trust and peace among Christians and Muslims. The food distributions has contributed to the peace and understanding and that both Christians and Muslims strive to live together and find common ground. In November 2014, Typhoon Haiyan, one of the strongest storms to make landfall in world history, affected more than 14 million people, and displaced 4 million. The Bayanihan Foundation Worldwide, together with partners Zakat Foundation and volunteer Medical Action Group (MAG), responded quickly by coordinating on the ground relief efforts in the affected areas. Two weeks after the storm hit, I was in Leyte and Samar with Evelyn Castillo, the Bayanihan Foundation Liaison providing emergency relief goods and supplies on the ground. Seeing that devastation was a life-changing experience. I thought about the many things we take for granted, living in Chicago – clean water, a decent meal and a safe place to stay. The families affected by Typhoon Haiyan were stripped of these basic necessities of life, and they have nowhere to turn. But I was surprised by the resiliency of the human spirit. 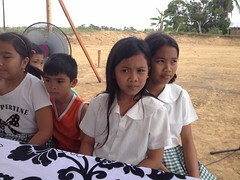 The residents of Leyte and Samar not only endured but thrived and they are rebuilding their lives. In 2008, I received the Chicago Community Trust Fellowship and I had the rare opportunity to travel back to the Philippines and visit my mother’s native village in Bicol, in the southernmost tip of Luzon Island, the largest island in the Philippine archipelago. There I was confronted with the poverty in the region and of my own distant relatives. I had the chance to travel back home and I saw the connection between the desperation of my family and the overwhelming number of immigrants who feel they must migrate to seek a better life. In May 2015, the Bayanihan Foundation offered the same opportunity to young Filipino Americans to go back home, discover their roots and at the same time offer them opportunities to become long-term partners for change in the Philippines. The NEXTGEN Fellows were Jane Baron, Marc Butiong and Jeselle Santiago. They visited the Philippines for 14 days. They discovered their homeland and cultural heritage; connected with their relatives; and explored opportunities to become long-term partners for change in the Philippines. In 2010, I’ve met James Castillo and I was impressed by his dedication and commitment to help back in the Philippines. In 2016, James Castillo became a board member of the Bayanihan Foundation and continues to help locally in the Filipino American community in Los Angeles and globally back in the Philippines. Has the Bayanihan Foundation made an impact in people’s lives? Is it making a difference? Do these donations really matter? I guess the next five years will tell if my efforts with the Bayanihan Foundation matter and that it eventually created positive social change. This entry was posted in Diaspora Donors, Diaspora Giving, Philippines and tagged Filipino diaspora, giving, Philippines. Bookmark the permalink.